48 million Americans have served in the United States Armed Forces. Tomorrow is November 11th, the day set aside to honor all Veterans past and present. There is a great deal of historical significance behind this day, some of it unknown or forgotten, some simply overlooked. Memorial Day and Veterans Day are often confused. Memorial Day is the fourth Monday in May, set aside to honor American service members who died in service to their country or as a result of injuries incurred during battle. Veterans Day is slightly different. It is always celebrated on November 11th no matter what day of the week it falls on, and honors all American veterans, living or dead, with special recognition to living veterans who served their country honorably during war and in peacetime. Veterans Day was originally called Armistice Day. The term comes from the armistice between Germany and the Allied Nations, which occurred on November 11, 1918, at the eleventh hour of the eleventh day of the eleventh month. It was signed by the French, English and Germans in a railway carriage at Compiègne as an agreement to end the fighting and begin peace negotiations. 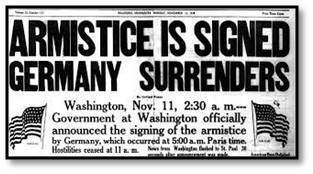 The Armistice itself was agreed to six hours earlier at 5:00 a.m. with the first stipulation being that fighting would end at 11:00 a.m. World War I did not officially end until June 28, 1919, with the Treaty of Versailles, but November 11 commemorates Germany’s surrender to the Allies. The first Armistice Day was commemorated in 1919 by President Wilson with “. . . thanksgiving and prayer and exercises designed to perpetuate peace through good will and mutual understanding between nations.” When the holiday was first celebrated, it was acknowledged with parades and a momentary suspension of commercial business; always observed at 11:00 a.m. to mark the significance of the day. This is still true in many cities across America as well as in Britain, France, Australia, and Canada; who commemorate the veterans of World War I and World War II on or near November 11th. In Washington, D.C, Arlington National Cemetery holds a ceremony every year to honor those who died in battle, again observing the 11th hour of the 11th day. A color guard represents all branches of the military at the Tomb of the Unknown Soldier, a monument dedicated to American service members who have died without their remains being identified. The tomb is inscribed with the words “Here rests in honored glory an American soldier known but to God.” The tomb has been patrolled continuously since 1930, guarded 24 hours a day, 365 days a year in all types of weather by the elite and highly trained members of the 3rd U.S. Infantry Regiment known as the Tomb Guards. 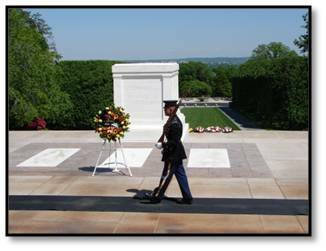 The guards march 21 steps down the black mat behind the Tomb, turn, face east for 21 seconds, turn and face north for 21 seconds, then take 21 steps back with absolute precision and a cadence timed at 90 steps per minute. The guard changes every hour on the hour. Twenty-one symbolizes the highest military honor bestowed on a solider—the 21 gun salute. Today there are 9.2 million veterans over the age of 65 and 1.8 million under the age of 35; a numerical testament to the ongoing involvement of the United States in foreign conflict. The average age of a veteran today is 58. From 1940 until 1973, men were drafted to fill vacancies in the armed forces that could not be filled through voluntary means. In 1973, as the Vietnam War was ending, the Selective Service announced the end of the draft and the United States moved to an all-volunteer military. The selective service remains in place as a contingency plan and men between the ages of 18 and 25 are still required to register so the draft can be resumed if needed. Just like the private-sector, the military now considers only highly skilled applicants. Today’s military is an all-volunteer force; men and women in uniform choose to wear them and must pass rigorous educational and physical tests to qualify for admission. Military leadership depends on a soldier’s ability to accomplish the mission by providing purpose, direction, and motivation to his or her troops in peacetime and war. Let us show our appreciation to them and to all who have gone before them for their dedication, service and the sacrifices made to keep our country free. I am proud to share this day with my Dad, celebrating his 94th birthday this week and a veteran of World War II and the Korean War, and our youngest son, who at 24 has chosen to serve his country and is preparing for deployment to Afghanistan. On Veterans Day and every day, I honor and thank you. 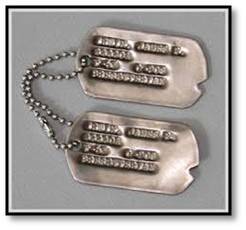 This entry was posted in Friends and Family, Guest Authors, History, Military, Susanne Skinner and tagged Arlington National Cemetery, Dwight D. Eisenhower, For the Fallen, Robert Binyon, Tomb Guards, Tomb of the Unknown Soldier by A Kaplan. Bookmark the permalink.